Mr Monkey caught a bus into Manchester, then scampered along to the press night of Fatherland. Produced as part of the Manchester International Festival, this is perfomed at the Royal Exchange Theatre. Fatherland was written by Scott Graham, Karl Hyde and Simon Stephens, after returning to their hometowns and interviewing a number of men about their relationships with their fathers, and about their experiences as fathers. The play combines dramatisations of the interview process with pieces based on results of interviews with men in the hometowns - Corby, Kidderminster and Stockport - of the writers. There are some set pieces involving chanting by the full cast, sometimes with dancing of a sort. It's an episodic piece with no particular storyline, except when one of the men interviewed starts questioning the whole artistic process. The stage is empty but for a rectangular platform of rusty metal, with sloping sides and what looked like hatches to Mr Monkey but turned out to be concealed frames and ladders needed during the play. Mr Monkey found Fatherland interesting and exhilarating but flawed in parts. He thought that repeating the same line several times didn't always make it sound any more profound than it did the first time. Mr Monkey felt that the apparent intention of producing an everyman view of fatherhood was undercut by the time dedicated to one particularly atypical event, even though it was presented spectacularly. Despite these problems - most of which he noticed on the bus home - Mr Monkey still found Fatherland deeply moving, especially in the more intimate non-spectacular parts where people were talking rather than chanting. 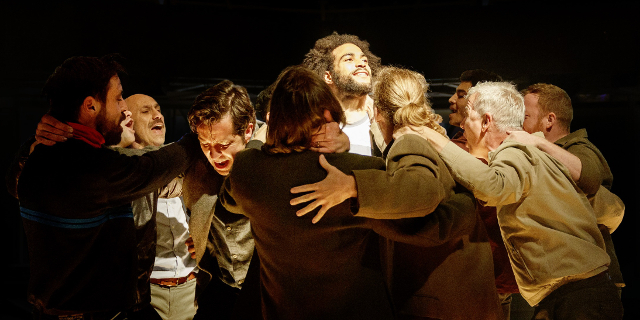 He was particularly impressed by a flying sequence, and by the thread in which Luke (Ryan Fletcher) queries the existence of the play. 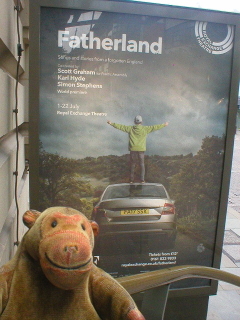 Despite some caveats Mr Monkey did enjoy Fatherland and recommends it to anyone who wants a different night out at the theatre. Fatherland runs until 22nd July 2017.